Toadwater | Toadwater Inn | Excalibus's Modern Tavern | Topic: Where Do You Call Home? 0 Members and 2 Guests are viewing this topic. I'm looking at the map and see a number of bases or areas that were worked with still existing fences (some that have been cut through), as well as regions where the fences must have rotted as worked land is open. For the current active players, what region of the world do you call home? Who has the cool owl in their base? I thought fences decayed over time. If this is the case, then there must still be people active enough to refresh, but they haven't repaired the holes in their fencing. Just trying to plan my drop-in location for when I jump. Re: Where Do You Call Home? but here is a map of some places I have checked within the last month or two.. The base with the owl in it is one of the best locations on the map, because of how little fencing it takes to secure it. I prefer a base with long open spaces, and the owl base is pretty cramped. Also, I find that fence lines on the map will stay there until someone walks by and updates the map, back when it was working. The only fenced-in areas are the ones that are in the image fresh linked, plus a handful of others. 1. It's a bit easier on your staff and health bar. 2. Managing multiple fence lines in a large area that are on opposite sides of each other (or a very long fence line) without hanglider use is a hassle. Make sure to have food (250 bell peppers should suffice), a shovel (preferably waxed), outhouse materials and your idols at the very least before you jump. I've seen both of you hard at work in-game so its nice to interact with you on the forums. Crowbarella has been doing quite a bit also. I was assuming this entire time the map was up-to-date, so good to know. I appreciate the updated map you've managed to throw together during your journeys. I'd agree, the Owl area seems a bit complicated in shape. As for my new home, I'm tempted to take the area south of Excalibus by the cave or whatever that is, but the small fences area on that little leg that sticks out makes it a little less desirable. Do you guys recommend locating myself somewhere near neighbors (you guys, Crowbarella, Ex) or grabbing a piece of land away from everyone else? I don't have any interest in raiding, if that's still a thing. Just want to see all the levels of trees and the new content since Classic. We're all that neighbor that you'll live next to for 30 years, but never actually see them leave the house. Just find whatever land looks best for you, being next to someone won't be an issue. There are smaller areas that will be easier to fence in and have plenty of space. 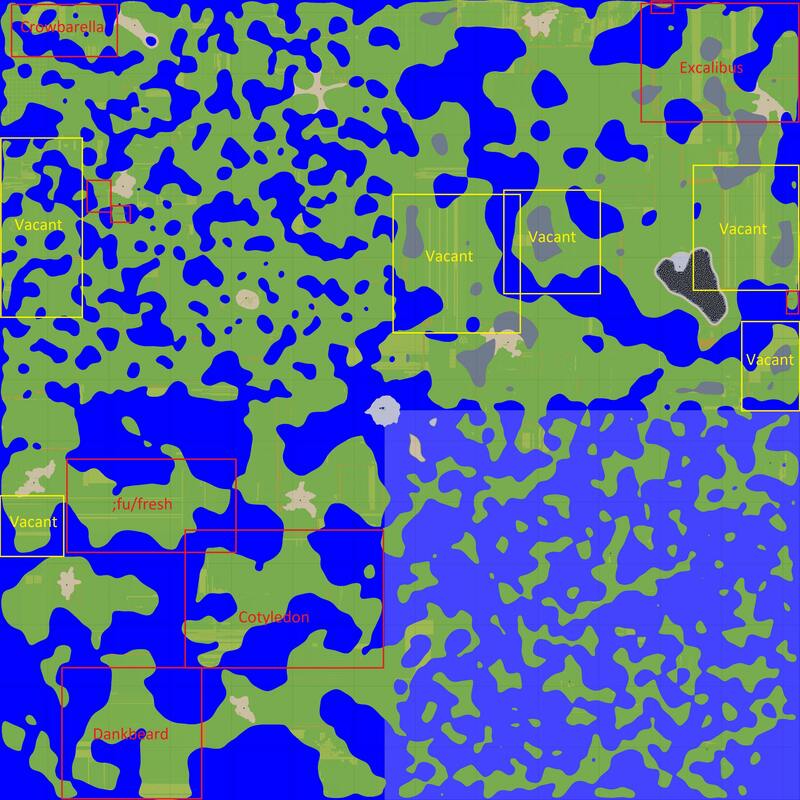 Those really big areas are really only good if you're macroing and you want to just leave it on a single row for as long as you can. If you're already fine with macroing, then the fencing shouldn't really be an issue! I ran macros in a past life, using AutoHotKey, but I need to relearn how to write the scripts for it. Do you guys ever trade or interact with each other? There used to be a lot more interaction/trading a few years ago, but now it's pretty rare. Most of the players (all 6 of us) do their own thing and don't really have any reason to trade. I am definitely open to trading! If you're looking for something just let me know here or a private message. I will probably pester you guys once I jump to see about trading. Right now I am trying to prep for the jump, which I may be playing too old school from that perspective, as I saw the help thread fu posted about jumping asap, I just feel like I need to be somewhat prepared or decent level. I dont play much anymore, but I have a lot of stuff if you need anything. Just sent up a store and msg it to me on IRC, use the chat link at the top of this forum if you dont have a client. Cool, thanks Ex I will definitely keep that in mind. I remember you and Crowbarella from back in the old days. Hope all is going well for you, and I maybe after a break you'll get reinvigorated for some more TW2 time. Let's get the watered toad fired back up again! Toadwater | Toadwater Inn | Excalibus's Modern Tavern | Topic: Where Do You Call Home?